Constant change is a new norm of eCommerce sphere. Dealing with shifting customer behaviors, outdated functionality, brand new applications and continuous adaptations is a part of online entrepreneur’s daily routine. Upgrading store is a crucial solution to remain one step ahead and cope with the competitive pressure. It is a forward-thinking way to give your e-store new capabilities to future-proof your business and meet your clients’ demands. How should you know it’s time to upgrade and once Magento is your choice what are the key points in Magento 1 vs Magento 2 opposition? We’ll dive into benefits of migrating to Magento 2 Commerce and share tech update considerations you’d better keep in mind. What does the Official Website Say? The so-called Magento 1 end of life has stirred a lot of noise. November 18, 2018 has become the date M1 entrepreneurs, agencies and developers are afraid desperately. Online entrepreneurs and developers have been discussing the issue day and night. You shouldn’t believe every Internet rumor - there are billions! Use only relevant sources to check such kind of information. Despite the end of life for the first version has been announced several times there is no citable statement about it. 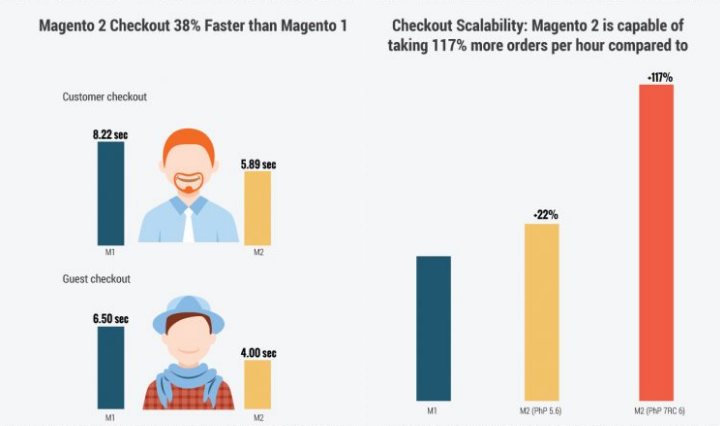 Scrolling through the official Magento blog, we came along useful post “Ongoing Magento 1 Support” claiming that the misconceptions should be dispelled. M1 users are assured to have open end support and will receive a notification 18 month in advance once any changes are introduced. Does it mean you should rest peacefully running store on M1? We bet not. Why? Keep reading to find out. How to Know the Time Has Come? Why do eCommerce solutions keep releasing new versions? How can you succeed with the outdated shopping cart? When is it better to upgrade: once YOU’re planning or when you’re HAVE NO OTHER CHOICE? Let’s focus on these significant points. First of all, due to open-source architecture new versions are inevitable for this eCommerce platform. This is the way the bugs could be fixed and improvements introduced, all the security matters covered. Answering the second question, needless to emphasize how fast technology is evolving and how much it’s going to cost you once clients exit your webpage because your site speed is too low or the product gallery lacks “cool” features the competitors already have. Once business success is what you are aimed at - you need a robust tool to manage it. And finally, speaking the best time for the update, note that even if you turn to the automated upgrade, you will need some time launching the data transfer, checking its results, cope with design customizations, hosting issues, etc. Here are the most significant aspects where M1 and M2 differ. 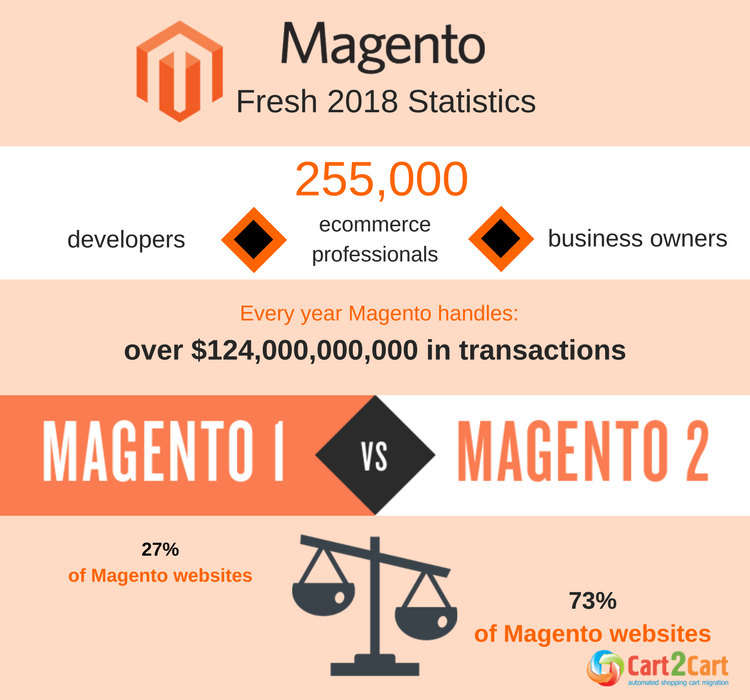 If you are considering making any changes to your store regarding any of these aspects you should seriously consider upgrading to Magento 2.2 as a part of those changes. Website performance was among the Top reasons the platform was redesigned. 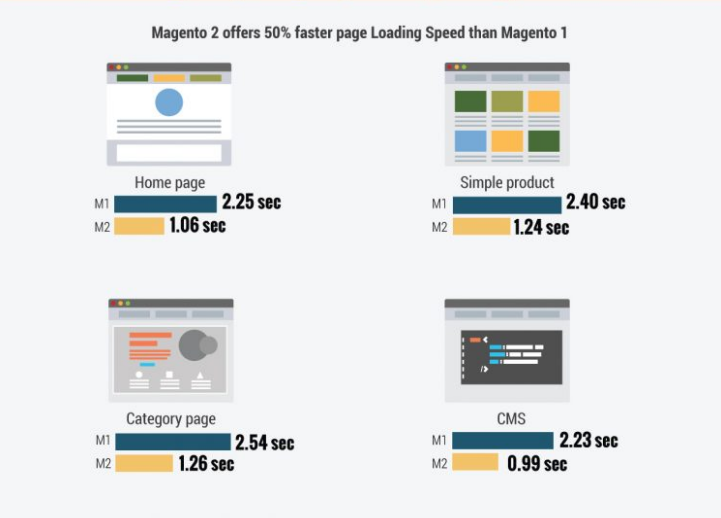 According to the research, Magento 2 pages are loading 30% to 50% faster. The updated version can cope with up to 39% more orders within an hour. In other words, with M2 more users will be able to interact with your e-store, the greater amount of products will be added to your site’s cart, and your profit will increase. Once your business grows, you are expected to get more traffic and need a solution to be able to cope with the massive flow of visitors. Do you know that M2 can handle 10 million views of the page within an hour, M1 would stop at 200 thousand? To get more information on the benefits you get from updating your e-shop to the latest version, visit a comprehensive review of Magento 2.2. features. Because the eCommerce solution leaves you to make the final decision when to upgrade the store only you with the team set a date for Magento to Magento migration into your business plan. Major Disadvantage? There is no magic one-click procedure to update Magento as in WordPress, for example. M2 has brand new architecture, thus, upgrade in its traditional way is virtually impossible. It is rather a data migration from one shopping cart to another and includes import of all the eCommerce categories. Way out? Cart2Cart automated migration service has thousands of Magento upgrades on its count and offers error-free eCommerce entities import. 100% uptime for the current store is secured. Support Team is available 24/7 to provide you with any additional info you might need or assist you with any stage of the data transfer. Check our Magento Upgrade Guide to dive into further details and find out the best way to upgrade Magento. With M2 you get a total omnichannel platform with advanced functionality. Once you’re serious about your eCommerce business - think the benefits over and leap to Magento 2. How about Free Demo to see how the enhanced store will look like? 2 thoughts on "Magento 1 vs Magento 2: How do I know it’s time to upgrade?" Hi! 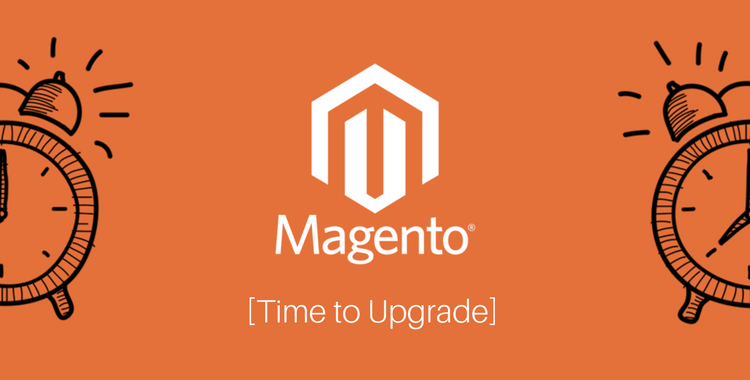 There are many methods how to upgrade Magento 2. Thank you for mentioning two of them. Yet there is a risk of losing data when transferring data from Magento admin panel. Yes, using composer is an alternative, though it requires special technical skills. Cart2Cart service is a smart choice for those who want to save time, company’s budget and own efforts .Have you tried performing Demo Migration with us? You’ll see that it is a great option to upgrade Magento.